OK it’s a fair cop guv. I’m in breach of the peace and I can’t even blame my parents. I was a big fan of Keith Jarrett, the jazz pianist. At one point in the seventies he concluded that electronic music was ‘bad’ for you. He took this to extremes. At some points in his live albums you hear the squeak of his piano stool and his moaning over the keyboard as loud as any diminished 9ths he’s banging out on the joanna. I was thinking of all these things while I watched Lykke Li the other night on the telly. She’s made the understandable link between noise and pop and came to some good conclusions. PJ Harvey (whose superb album I love very much) is retreating a little from the lovely cacophony she used to make in favour of newer, gentler sounds. They are, of course, both correct in their own way. Lykke’s sound (on the song I saw) took most of its backing from a battery of drums and percussion and in these harsh times it was good to see her employing a phalanx of skin beaters. These boys are nearly out of work thanks to computers and drum machines so I’d imagine their shop steward must have been smiling as he stirred his tea the following morning. 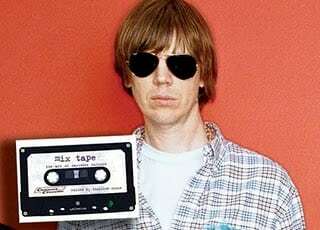 the man who brought you Sonic Youth. No stranger to a Velvetsesque sound fuzz, Thurston has released a lovely lead track from his new album produced by Beck. The song is called Benediction and if the AC had a single of the week it would be mine. The second loud guy is J Mascis. Dinosaur Jnr were kings of volume back in the day. I remember a friend of mine salivating about the array of Marshall Stacks on display at the Brixton Academy when they played there a few years back. Maybe it all got too much? 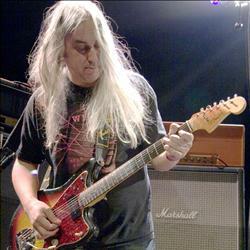 Who knows…in any case J Mascis has now brought out new (whisper it) quiet acoustic music. It’s very good too and you’ll hear a song on Friday. Then there’s my good friends The Leopards. If you thought Jim Jones Revue were loud then The Leopards could teach them a thing or two. I should know as The Leopards is the brainchild of Mick Slaven, Deacon Blue’s extra guitarist who has played along side me on stage now for the best part of the last 15 years. Mick is my favourite guitarist in the world and he told me about a ‘country’ song on the new Leopards album a little while ago. When you hear it on Friday I know you’ll love it. But amid all this anti-racket there is an even quieter man. Matthew Houck, the singer and writer from Phosphorescent will be in session and conversation. Matthew came in to record some solo versions of songs from Phosphorescent’s beautiful album “Here’s To Taking It Easy” last year when the band were in Glasgow for a gig. Later on I got a chance to chat to him down the line from New York where he now lives. He’s a great writer and performer and more than that he’s a man who made an album called “To Willie” where Phosphorescent echoed Willie Nelson’s album “To Lefty From Willie” by covering all Willie Nelson songs. 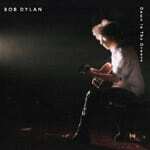 Down in The Groove came out in 1988. Again it’s an album which, given the amount of amazing stuff he’s done, hasn’t spent time on anyone’s CD deck for a wee while. There are some fine moments, as ever and we’ll highlight those on Friday. It all starts at Five Past Eight on BBC Radio Scotland.